⬅ Who Can You Truly Help? Can you expose the top 3 absurd assumptions of evolution? You have probably seen evolutionary charts like this… but you might not have seen how to expose the faulty arguments behind them. Those arguments have deceived many students into thinking the Genesis record is unscientific. In reality, all a person has to do is ask some logical questions to reveal the utter foolishness of evolutionary assumptions. You’ve heard educated evolutionists insist that it took a loooooong time… and that it was undirected by a Designer or God so it all happened by random chance… and of course, simple things got more complex – that’s evolution in a nutshell isn’t it? Don’t forget this key piece of the discussion. And don’t forget the simple questions you can use to reveal the ‘emptiness’ of those two supposed ‘scientific’ causes for the two most significant ‘effects’ that can lead anyone to a realization that there has to be a Creator. #1 – Did you ever see an explosion cause an increase in the orderliness and complexity of anything? #2 – Can you even imagine how to put life into chemicals, even if they are cleverly arranged into all the organs and systems of a now-dead corpse? 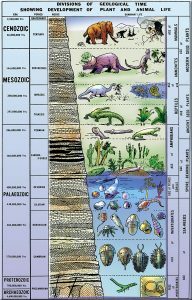 What’s really at the bottom of evolution teaching? What is seldom mentioned to unwary and impressionable young students today is that evolutionists believe in bigger miracles than Christians ever dreamed of. They even admit it on occasion. And the reason their misguided faith is really nothing less than sheer gullibility is because their miracles had no adequate cause to perform them. Nature and common sense demonstrate scientifically that any result or ‘effect’ requires an adequate cause. By definition, the Creator of the universe that exists independent of natural substances is the only adequate “cause” for the universe and life. But, evolutionists are religiously committed to their insane ‘faith’ because they don’t want to acknowledge the reality of their Creator. Don’t forget that. That’s why the apostle Paul says in his letter to the Roman Christians in the first century: “..just as they did not see fit to acknowledge God any longer, God gave them over to a depraved mind…” (Romans 1:28). So how do we expose the 3 absurd assumptions of evolution? And do it in a gracious and sensible way? We go into a lot of colorful and fascinating background detail in my book, “Unlocking the Mysteries of Creation,” but let’s keep this as simple as possible. Here’s the bottom line. What are the chances of producing orderly sequences of understandable information and systems randomly? In their assertion that random chance is capable of evolving higher forms of life (or any kind of first life for that matter) evolutionists ignore a mountain of evidence. It’s called “mathematical probability statistics.” With modern analytical equipment we now know how extraordinarily complex living systems really are. We now have no scientific excuse for believing in naturalistic evolution. Ask, “What are the chances of letting random accidental processes produce even a simple system of information?” Evidence of design should logically cause us to look for a designer. To the evolutionist’s shame, he refuses to “allow a Divine foot in the door” no matter how ridiculous are his ideas about how intricately designed living beings came to be. When someone insists that random genetic mutations and natural selection are the process of evolving from ‘Goo’ to You by way of the zoo, you might want to ask them a question or two. Have you seen what mutations really produce? They are not pretty. Thankfully they are rare. In 5,000 years we’ve never scientifically seen what is agreed by everyone to be a single positive genetic mutation. It’s clear there isn’t enough time for mutations to do their ‘magic’ even if you had billions of billions of years to arrive at a world full of amazing creatures. How do you produce a system like a caterpillar turning into a butterfly by way of random mutations? And when you consider that ‘natural selection’ is only capable of eliminating unfit offspring (the so-called “survival of the fittest”), it says nothing about the ‘arrival of the fittest’ in the first place. You can’t get “more information” from “less information.” Someone with intelligence and a high degree of technical skill has to ‘engineer’ biologically increasing complexity. To believe that bacteria evolved into worms and worms evolved into reptiles and reptiles evolved into birds (and eventually man) is not supported by ANY facts of science. Evolution is a belief system that is totally devoid of scientific support. Those who insist on it are doing so only because they choose to reject the Creator. Typically, they have distorted concepts about God and some kind of attitude that resists acknowledging their personal accountability for their actions. So why do so many people choose to believe in evolution? Would you say that the belief in evolution qualifies for “a lie” that condemns them to their own just outcome if they choose to reject the truth of God?